Today, a tiny smattering of snow fell on Glasgow. 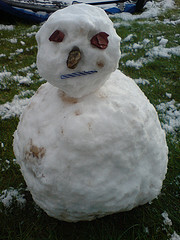 However, as it is so far the only white stuff to lie for more than five minutes this year, the above, tiny, snowperson was quickly thrown together. Feeling the winter magic? Excellent.